As promised, I will be featuring each of the charity quilts but in groups of 10, so you can see them better. Here is my fourth group of 10 - so technically these are April's charity quilts. I just finished them up a bit early! As I have been eyeballing these as a whole - the big picture-- I've come to realize that I really need a bigger variety of styles. I have a whole, whole bunch of Around the World ones, but I am hoping later this year to make up at least 10 of the ones I made in previous years earlier like these. 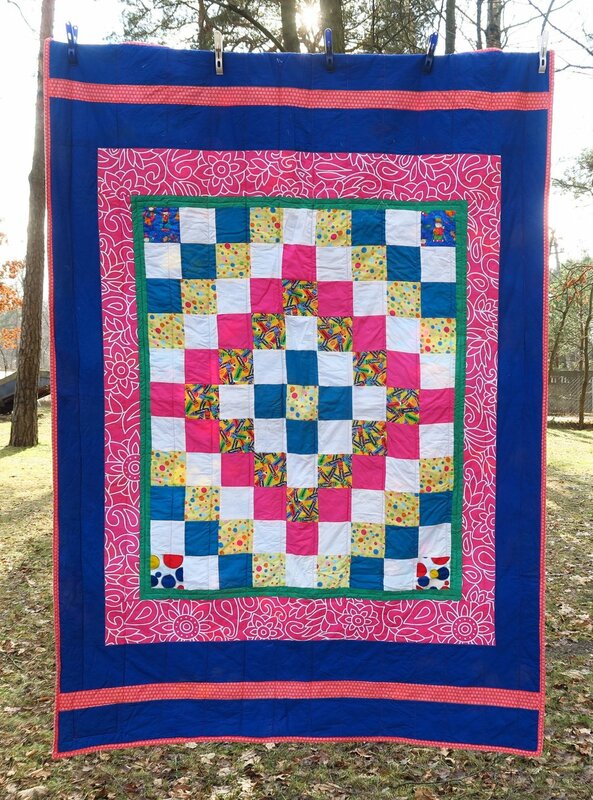 I also want to make up some more of the Scrapbook style of children's quilts that I made previously. I liked them and they were a great way to use up a variety of kid-friendly prints when I didn't know how else to use them. A simple rail fence in solids. These are also all gone. Scrapbook style I was able to use a variety of children's prints in these. But for now, these are what I have. It's good that I've done them so quickly right now as I really do have a lot better picture of what I've got. Of course, I will have a bigger variety of quilts coming in the next few "charity quilt shows". This is with these quilts added to my piles. It is fun to see these grow higher and higher! I think it looks neat! But don't forget - if you need something for your own quilting, be sure to check out what my sis has for you over in the store!